I like putting spring bulbs right in the front lawn for a couple of reasons. It's the sunniest part of my yard and also the plants really seem to like it. The daffodils you see here were not planted last fall as you might think. Instead they are the naturalized bulbs that have come back every year over the past three to four seasons. I notice that some of my favorites never make another appearance after their initial run while others return in bigger, sturdier clumps each time. We have dozens of hybrids and they bloom over many weeks in April and May. I've tried to identify those that have naturalized particularly well in the captions below. 'Mon Cherie' (I think). I once thought I wouldn't like the pink daffodils but in real life they aren't really very pink after all—more of a beautiful tawny blush color. This year I have both purple and white snake's head lilies (Fritillary meleagris) coming up all over the lawn. Even though I remember planting them in one spot, they seem to travel around on their own. Perhaps the seeds are transported by animals? Anyway, it's exciting—for me at least—to discover these strange flowers in places you had no idea they'd end up. The secret to naturalizing bulbs is to ignore them. I don't fertilize or even irrigate them once their planted—granted it has been pretty rainy these past years. In the fall I just slice open crescents of turf, fold them back and dig down holes to the proper depth (usually 6-8 inches). I then put in the bulbs and tamp the soil and turf back on top like a lid. Once they've finished blooming in the spring you just have to be sure to leave the leaves on long enough to nourish the bulbs. I wait till the foliage starts to yellow which can be mid-June. So be aware that they will look a little wild—some would say messy— until you're able to chop them back. In the meantime we just mow around the clumps and act like we mean it...the neighbors think we're kind of eccentric anyway. PS the deer don't touch them. I was lucky to hear Mr. Allen speak in NYC a few weeks on a WNYC panel about his organization, Growing Power, and his work in Milwaukee. He is an amazing thinker and speaker on the topics of urban farming and food justice. Read more about him at Time. Also there was a good article on him in The New York Times Magazine last year. Read it here. I profile his daughter Erika Allen and her work in Chicago in my upcoming book. One of the things about only seeing your garden once a week or so is that you really look forward to what surprises you'll find each time you arrive. Last weekend, the daffodils were the stars (more in the next post) but I also found these odds and ends around. I usually pick some flowers to take into the house—or back to the city—so I can appreciate them more closely. From left to right: maroon snake's-head lily (Fritillaria meleagris), blue squills (Scilla siberica), white summer snowflake (Leucojum vernum), assorted green hellebores and a two-toned grape hyacinth (Muscari aucheri 'Mount Hood'). Dominique Browning, my friend and ex-editor at House & Garden, just put up an interesting post about "Blown Bouquets" at her new blog Slow Love Life. Be sure to look out for her memoir Slow Love published by Atlas any day now. 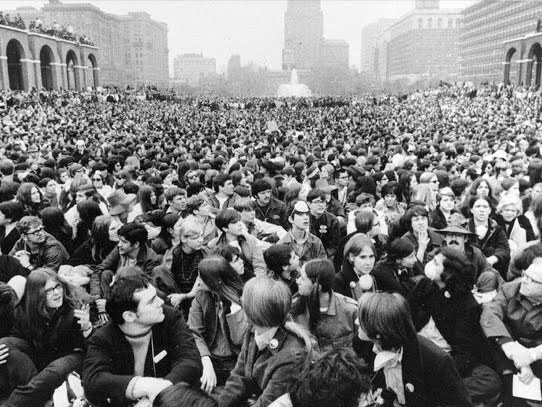 Celebrate by watching Earth Days, a moving, insightful American Experience documentary on the history of the environmental movement. Watch it online at PBS.org here. I wrote about Alan Gray and Graham Robeson's eye-popping garden, East Ruston Old Vicarage, in the March 11th issue of WSJ Magazine. 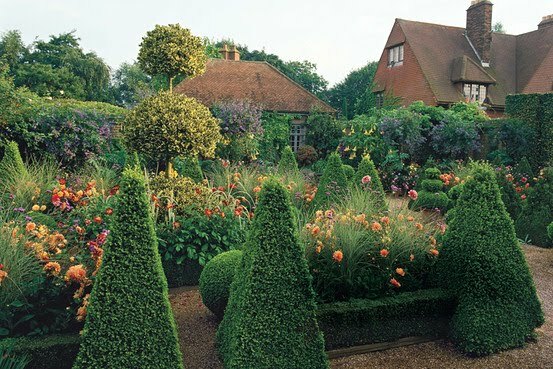 This vast garden has to be seen to be believed. Mr. Gray, a consummate plantsman and very charismatic fellow, is speaking at The New York Botanical Garden on May 7th. Don't miss the chance to hear him and see more photographs of this amazing place. 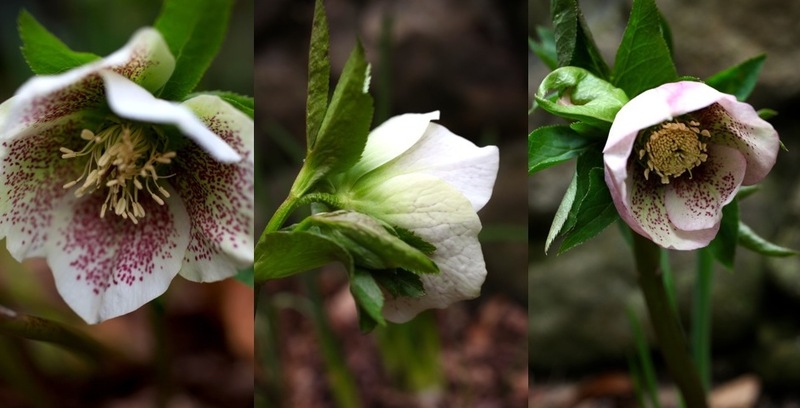 Barbara Israel is delighted to introduce British gardener extraordinaire Alan Gray to The New York Botanical Garden to give a talk during the annual Antique Garden Furniture show. Recently profiled in The Wall Street Journal, Mr. Gray is known throughout the UK both as a television presenter for “Glorious Gardens”, a BBC garden host, and most particularly for the exceptional East Ruston Old Vicarage Garden that he and Graham Robeson have created at their home in East Ruston, Norfolk. Mr. Gray’s appearance at The New York Botanical Garden offers a unique opportunity to learn from one of Europe’s foremost experts on garden design, horticulture, and plant varietals. Gray and Robeson have created a spectacularly designed thirty-acre oasis on a windy stretch of property on the North Sea that was literally a barren prairie landscape 20 years years ago. 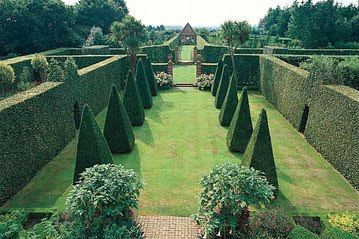 Now it boasts a vast array of gardens showcasing plants from many countries and styles." May 7 at 2PM at the Janet and Arthur Ross Lecture Hall, The New York Botanical Garden. The $20 ALL Garden Pass includes admission to the talk as well as the Antique Garden Furniture Show. Members are free. Things happen slower upstate. Those of you who have ever tried to engage a contractor know this for fact. 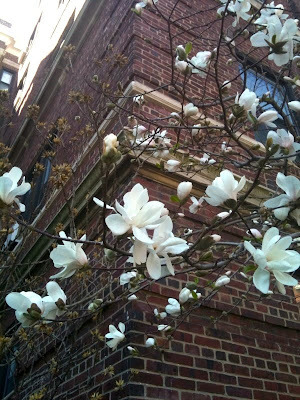 Out in our front lawn, we see bulb varieties that have already swooned weeks ago in the heat of our New York City April. 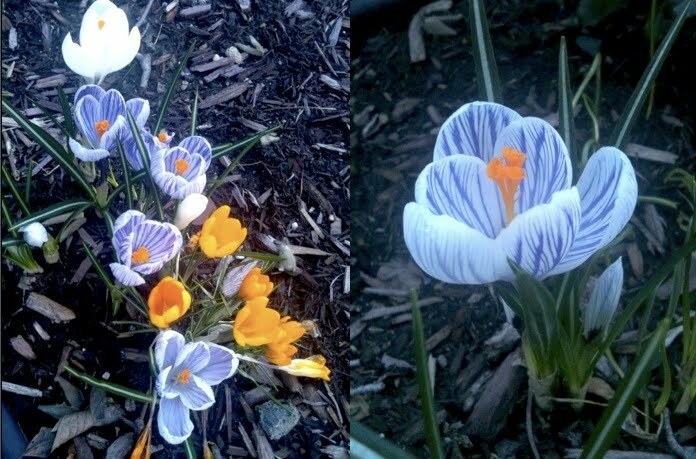 I plan to get many more of the prim white crocus above. Her name, 'Miss Vain', suits her well. The graceful flowers remind me of the rain lilies (Zephyranthes) that used to pop up overnight in our front lawn in Texas after a storm. Scillas reliably come up through tufts of moss and grass every year. I wish I kept better track of the names of the hellebores. These do well at the base of the stone chimney. 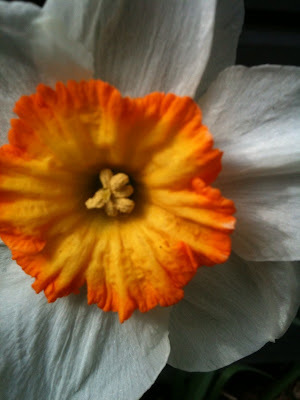 The always reliable 'King Alfred' was our first daffodil to bloom this season. This 'Flower Record' crocus looks a bit lonely by itself. 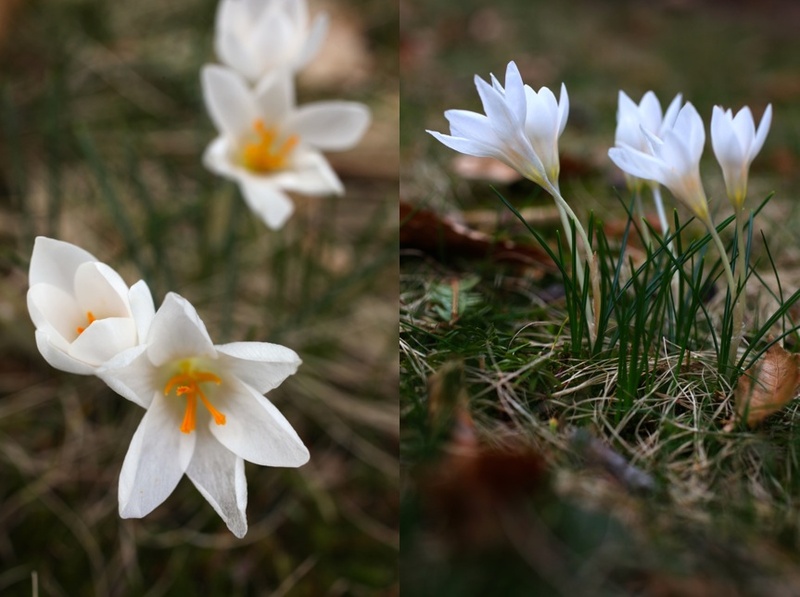 Bulb expert and author Anna Pavord recommends Crocus tommasinianus as a good naturalizer for the lawn. I will take her advice this fall. I wrote about her wonderful new book here. We are starting a rock garden around the bluestone patio. The little irises like 'Harmony' seem very happy there. My favorite small iris is 'Katharine Hodgkin', above. She is the color of a blue oxford shirt with yellow falls spotted and striped with deeper blue. In slight shade, below, the markings are even more distinct where they don't get bleached by the sun. Anna Pavord calls this variety "subdued and strange in its beauty". It was hybridized in 1958 by a alpine garden enthusiast in Gloucestershire and he named it for the wife of fellow rare bulb collector. They'll be many more daffodils to come. Stay tuned! 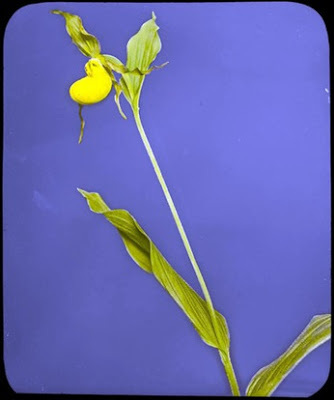 I heard an interesting radio segment on WNYC about the introduced and endangered plant communities around New York City (such as this rare ground orchid). We've lost about 50 native plant species over the past couple of decades. Meanwhile, other new plants that once couldn't survive here now do. Listen below. 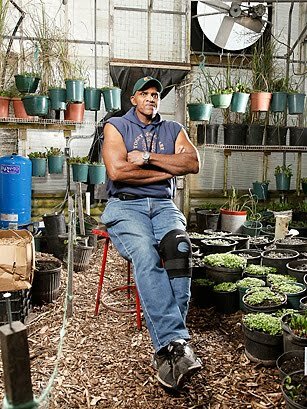 "Dr. Gerry Moore, director of science at the Brooklyn Botanic Garden and coordinator of the New York Metropolitan Flora project, discusses the first definitive findings that New York is losing native plants and many are being replaced with new plants, many from the South. The New York Metropolitan Flora Project is the most comprehensive study ever undertaken of plant biodiversity in the metropolitan New York area." One of the nice things about Jackson Heights is the maturity of many of the shrub and tree plantings around the co-op apartments. We saw this huge andromeda (Pieris japonica) in full bloom next to a sculptural small-leaved azalea at The Towers. This impressive andromeda is about 8 feet tall and since they are very slow growing, you know it has to be quite old. 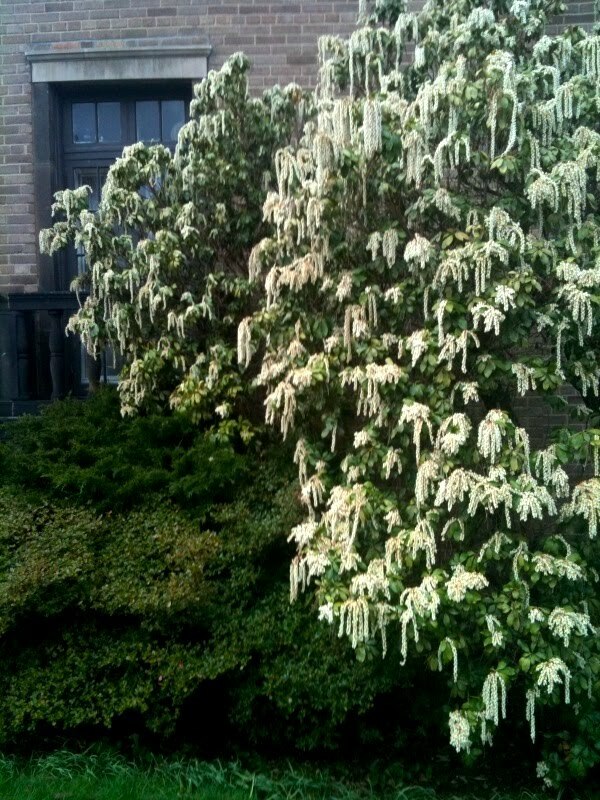 The dangling white flowers are about 4-inches long and remind me of old costume jewelry. 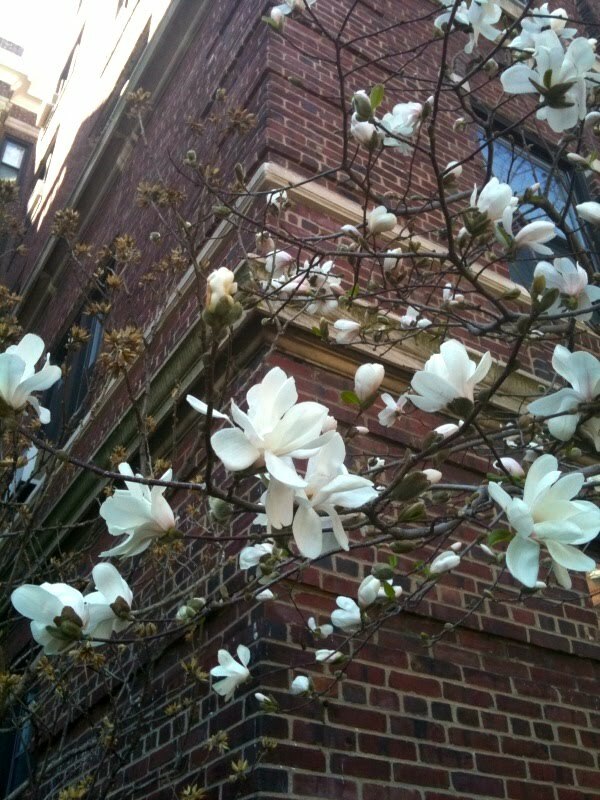 This star magnolia on the corner was the first tree to bloom. Hello, nice to see you. Can anyone identify this ferny-leaved plant? The flowers are yellow. 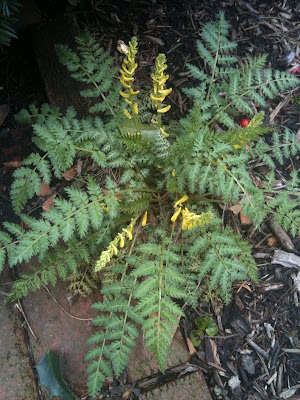 There was another one growing in the crevice of a wall kind of like a corydalis... Any ideas?